Oh this is beautiful! I love that blue...so fresh and pretty with the white! And love the addition of the butterflies and the pin! I really have to get me some beads and pins and make some. I wanted one for my triangle tube, but didn't have the supplies...can you believe that? Thanks for playing our JUGs challenge and for purchasing the templates! Can't wait to see the other ones! Happy New Year! Bronwyn! My word! This is gorgeous! 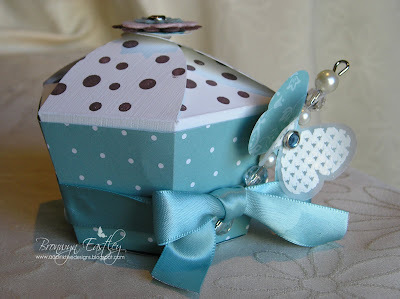 I have to say, it was the cupcake that first got me browsing Kelleigh's website so I am definitely partial to that one :)I love the combo of vellum, ribbon and hat pin. A beautiful way to make this a "grownup cupcake". Thanks so much for playing with Just Us Girls this week. Be sure and email me for your 40% off coupon code to Kelleigh's store for the next time you are shopping. You can find me at paperdaydream at aol dot com. This is FABULOUS!! I adore the colors, and the butterfly! Great job! Just beautiful! LOVE the butterfly but I've always been afraid of pins - maybe I'm afraid I'll poke myself and bleed on my completed project and ruin it!!! LOVE the colors and the flower on top. BTW I went back and purchased 6 more templates once I got the coupon. I'm going to go make another one now!!! Very cute and nicely done. The little extras are wonderful.. Love the embossed vellum butterfly and pearl hat pin. This is a template I too have looked at. Was it easy to put together? 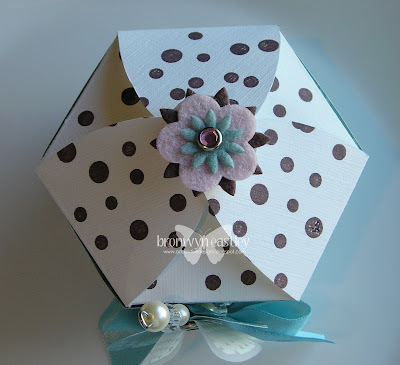 What a super cute cupcake template box! I just love everything about it! The embossing on the vellum butterfly, the beaded stick pin & rhinestone embellished flower on the top!! You sure did a great job with this week's template challenge at Just Us Girls! Thank you so much for playing along! I hope you return Saturday for an all new challenge! WOW Bron this is amazing!!! AMAZING!! I LOVE IT SOOOO MUCH and the detail is super awesome!! Oh and I love the baby card too I've just seen, again your little head is coming up with some beauties!!! Have a great New Year's eve! See you in 2010 indeed! This is just fantastic! The details are just incredible!! 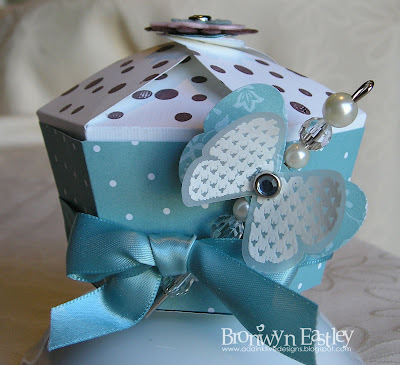 Who wouldn't LOVE to receive this pretty-as-a-picture gift box?!?! And, as a fellow SU dem, believe me when I say you should submit this to SU for publication!!! 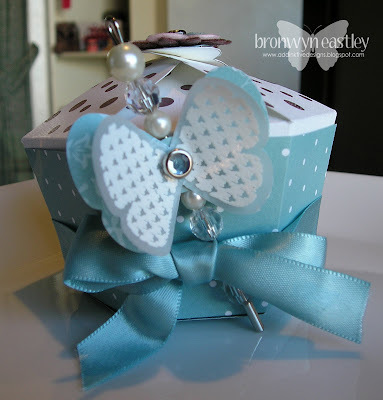 Just beautiful - I love what you did with the cupcake box. 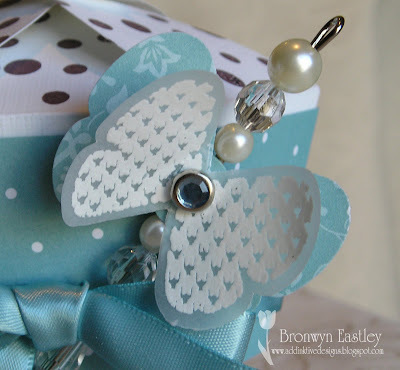 The butterfly and pin are dynomite additions and add just a touch of elegance to your project! Thanks for playing along with Just Us Girls. This is just divine! As soon as I saw your entry I got on to Kelleigh's page and downloaded some templates myself! I love what you've done with the cupcake template - that's next on my list to try! This is absolutely gorgeous Bronwyn!! I love the pretty pin, too! Very elegant. Thanks for using my template! !